This Series 1 E-Type Coupe has just completed a comprehensive Show/Driver rotisserie restoration to very high standards. While the car can be shown, or driven as desired, the Coupe’s restoration was focused on show competition, and as such, stands as an excellent candidate for competitive showing. 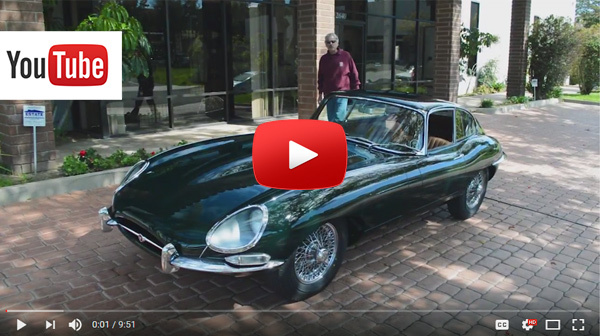 During the XKE’s restoration process, it was fully disassembled and photo documented; the car was then taken to bare metal, metal worked on a rotisserie, then finished and repainted in British Racing Green. All mechanical systems were gone through and rebuilt to specification, and all brite work has been re-plated to show quality. The XKE has received a newly trimmed Tan interior, custom-fit and installed, along with leather trimmed seats, its original wooden steering wheel, fully restored, along with a complimenting fully functional, period-correct AM-FM radio. All mechanical components were gone through including the electrical, cooling, fuel, and the hydraulic systems, with each brought back to their respective factory specifications. The engine, transmission, and rear end have been completely rebuilt, along with the carburetors, starter, and alternator. The Coupe’s radiator and epoxy-sealed gas tank were fully restored as well, along with the addition of a new stainless steel exhaust system. 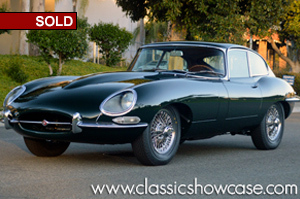 With such coveted Series 1-specific features such as covered headlights, triple SU carbs, toggle switches, and comfortable seats, this example is a part of the generation of XKEs known to be one of the most classic and drive-able of all early E-Types.